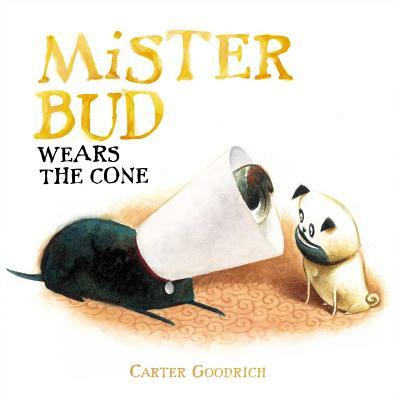 In this next addition to an adventure Booklist called “a treat for dog lovers young and old,” canine pals Mister Bud and Zorro encounter…the cone. Mister Bud and Zorro learned how to get along in Say Hello to Zorro! They made it through Zorro’s new wardrobe in Zorro Gets an Outfit. But how will they handle Mister Bud’s latest predicament? Because he has to wear...the cone. Carter Goodrich, who is “brilliant at depicting doggy emotions” (School Library Journal), cleverly portrays this relatable tale of misplaced shame and the love that surpasses it. "A succinct, masterfully paced text.... Zorro and Mister Bud are quite a pair; readers will hope for more unpredictable but amusing adventures with them." "The humor and situations will appeal to any child who has ever experienced sibling rivalry. A great addition for kids looking for a story about dogs and for a canine-centered read-aloud." "A succinct, masterfully paced text...."
"Reader's hearts will be with Mr. Bud"
"the canine odd couple for sure"